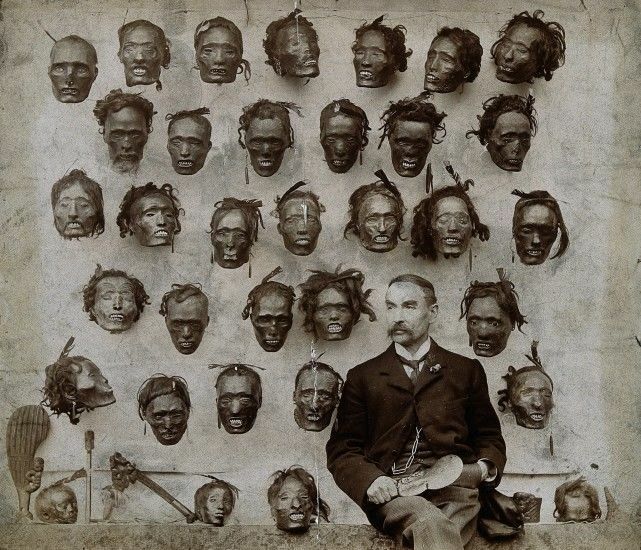 Horatio Gordon Robley (28 June 1840 – 29 October 1930) was a British soldier, artist and macabre collector of mokomokai (Māori heads) and antiquities. Robley was born at Funchal, Madeira on 28 June 1840, the son of Captain John Horatio Robley and Augusta June Penfold. Robley followed in his father's footsteps and became a professional soldier. However he also inherited his mother's artistic skills and became an accomplished sketcher and watercolourist. In 1858 Robley purchased an ensigncy in the 68th Durham Light Infantry for 450 pounds. After a short period of training in Ireland he joined his regiment in Burma where he remained for nearly five years. There he observed the people and learned the language. In addition to his military duties Robley continued with his sketching and made visits into the countryside to document daily life. When sketching Buddhist temples he became friendly with several Buddhist monks and had an image of Buddha tattooed in red on his right arm. This was the start of a lifelong interest in the practice of tattooing. The numerous sketches made during this period formed the basis for his illustrations some years later, when he was asked by the firm Cassells & Co. to contribute to their publication, Races of Mankind. In 1860 Robley was sent home to England for a period of sick leave. He began to specialise in rifle shooting, applying for and being granted a term in the School of Musketry. Rejoining his regiment he was present at the siege of Delhi (1857); afterwards, at Rangoon, he assumed command of the guard of the exiled Mughal Bahadur Shah II. In 1863 the 68th Regiment left Burma for the New Zealand land wars and landed at Auckland, New Zealand on 8 January 1864. Again displaying a desire to absorb his new surroundings, Robley purchased a Māori vocabulary and other books about Māori. In the following April, Robley took his troops to Tauranga to join General Cameron's forces attacking Pukehinahina also known as Gate Pā. British forces suffered a humiliating defeat in the Battle of Gate Pā on 29 April 1864, with 31 killed and 80 wounded despite vastly outnumbering their Māori foe. Gate Pā was the single most devastating defeat suffered by the British military in the New Zealand wars: while British casualties totaled more than a third of the storming party, Māori losses totaled about 25. Robley remained at Tauranga for 19 months until the beginning of 1866 during which time he continued drawing. He completed a series of detailed sketches of the Māori defences at Pukehinahina and continued his interest in tattooing and completed accurate sketches of the tattoo designs of the wounded and dead. Several of these scenes were later reproduced in the Illustrated London News between 1864 and 1867. During his time in New Zealand he met Herete Mauao and they had a son whom they named Hamiora Tu Ropere. His regiment was withdrawn from Tauranga early in 1866 and sailed from Auckland arriving back in England at Spithead on 28 June 1866. In 1870 Robley purchased a captaincy for £1,100, and on 4 February 1871 transferred to the Argyll and Sutherland Highlanders. He remained on Home Service until 1880, when he was promoted to major and dispatched to Mauritius. Later he was sent to South Africa and saw service in Cape Colony, Natal and Zululand. He then went to Ceylon where, in 1882, he was promoted to Lieutenant-Colonel and assumed command of the regiment. He wrote his regiment's history. In 1887 he retired from the Army with the rank of Major-General and returned to live in London. Continuing with writing after his retirement, he returned to his interest in tattoos and wrote two books relating to his time in New Zealand, Moko or Maori Tattooing in 1896 and Pounamu: Notes on New Zealand Greenstone.